The author thanks former Councilmember Connie Hutchinson and Mayor Steve DeBenedittis for their valuable comments. Several weeks later, when I stated that some developers were asserting that the DMP no longer mattered, the town staff avowed that the developers were wrong. The sharp come back had suggested an unusual discomfort with my statement..
A short time later, I found that the two appraisals of the town-owned properties were based on development densities that were two to three times than those approved for the DMP.1 It was hard to believe that the appraisers could be so wrong. A few months later, I were to find out that Mayor Lisa Merkel, during much of her tenure, had claimed, sometimes very proudly, that her efforts to redevelop the downtown will create a “small-town feel”. While some residents may have been swept away by her unbridled enthusiasm, others were suspicious and asked, ” Isn’t her claim nothing more than the sales pitch of a cheerleader?” Consequently, I decided to examine the details and write the 4-Part series. In 2009 and 2010 the people of Herndon came together to create a shared vision of what they wanted their future downtown to be: Three story commercial and mixed-use buildings along the main streets, one or two 4-story residential apartment buildings and a 2-story commercial center on Station Street. 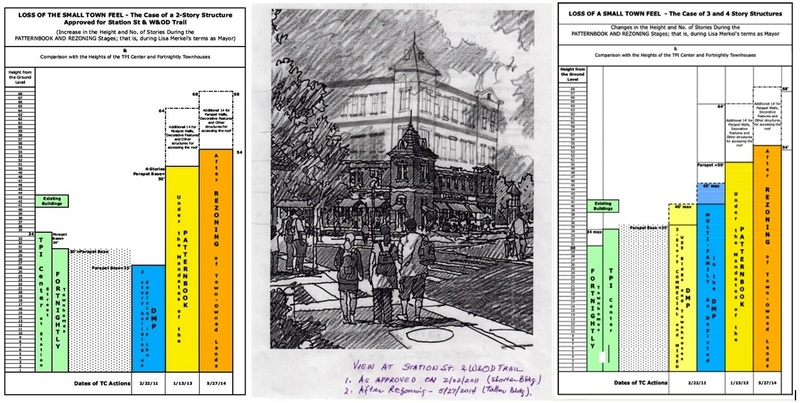 Sketches were drawn to show the look and feel of this revived downtown, and the Townspeople were happy and excited to have their vision come to life in the form of a Downtown Master Plan and its illustrations. Mayor Merkel and her supporters on the council started to make changes to the community’s vision immediately after (some say, even before) taking office in 2012. They had made major changes by the time they produced the Pattern Book six months later. The changes were not so obvious to most people. Small changes to key definitions, or important words made big difference in what could be built in the downtown. The rezoning actions in 2014 and 2015 increased building heights again, in more ways than one, changed the location of Arts facilities, redefined uses by floor in some locations, added sketches that reminded one of modern urban design, and hamstrung the HPRB by restricting its review. In place of 2 or 3-story buildings, developers would be able to build 4-story structures by right. Rather than mostly 30’- 40’ tall buildings, one would see 54’ to 68’ tall buildings on practically all of the downtown streets. If you had thought the Diamond Hotel was massive, think again. If you think Fortnightly townhouses are too tall, think again. A denser “urban” enclave, instead of a quaint, cherished downtown with a small town feel, seems to be in the offing. How and why did this happen? Parts 1-3 of this Series explain it all. There are good reasons to believe that the 2012-2014 Council increased the density to induce developers to build a “free” Art Center. Follow along and come to your own conclusions. The attached exhibits illustrate the changes rather decisively. Now, as the Town gets ready to review development proposals that are likely to include four-story residential mixed-use buildings along the major streets and over much of the downtown, will the citizens step up to defend their original vision, or will they remain silent and let a short-sighted council allow higher density and taller buildings to change the landscape and feel of our downtown forever? This was the extent of the discussion that took place that day. Note that Mr. East had objected not to a height of 64’ or even 50’, but to revealing that the maximum height was 64’. Perhaps, the word had reached the commissioners that the Mayor, town staff and the Town Manager had not only set the maximum height for a 4-story building at 50’ but had also added another 14 ‘ for parapet walls, other accessory structures and penthouses after talking with the builders. UNDER THIS SCHEME, A 4-STORY RESIDENTIAL BUILDING WOULD BECOME A 5-STORY BUILDING, EXCEPT THAT THE PENTHOUSE WOULD NOT BE COUNTED AS A STORY. Also notice that Mr. LeReche did not answer Ms. Bettard’s question. Perhaps, he did not want to reveal that they were approving 5-story buildings in some cases. There was no point for the PC to get into much discussion of height and mass of buildings. Sadly, such is the work of the Planning Commission in our town, often enough. No one from the Mayor’s side – Melissa Jonas, Sheila Olem & Grace Wolf asked any questions about the height or the massing of the downtown buildings, even after the base height was increased from 50’ to 54’ during the rezoning in 2014. They were not going to risk Mayor Merkel’s wrath by asking questions. A small Town Feel had been the defining issue for Councilmember Hutchinson and even for Councilmember Waddell for a very long time. How they were side stepped during the 2014 rezoning hearings is a matter that would be discussed in another blog post. 1 The two appraisals were based on independent determinations by the appraisers that between 200 and 300 residential apartment units in 4-story (54’-68’) high buildings could be built on the town-owned downtown land. Please respect the history and ancestors of this small town. It looks like the Queen Mayor has a wand to make the downtown an over priced jungle (like Reston or Oz) to make a name for herself. Maybe this is her plan to weed out all the lower income residents, so Herndon is more snobby upper class folk like her. If she liked this town enough to move here, then she should stop remolding the town. This isn’t a redecorating project. Power has gone to her head. You are currently reading Herndon’s Unfinished Fight For A Small-Town Feel – Part 4 at Herndon Opinion by Jasbinder Singh and friends.